This page presents my understanding of the current status of Sandy Lake and Environs/the proposed Sandy Lake Regional Park and Wilderness Area; and how the observations I have been making relate to that area. Other sections of the website provide more details on the observations and on related documentation & resources. I am expecting to revise this page as I receive feedback on it. – dp Jan 11, 2018. For a shorter overview, see the new Pamphlet on Sandy Lake Regional Park produced by the Sandy Lake Regional Park Coalition in June of 2018. Presentation by David P to Sackville Rivers Association, Dec 6, 2018. View PDF of slides and/or slides and audio as a video (1 hr 9 min). View From the Air for a quick birds-eye view of the place. Click on a title to go to a particlar section. 11. What would our grandchildren’s grandchildren wish we do with this land? Sandy Lake lies just northwest of the top of the Bedford Basin in Halifax, Nova Scotia. Sometimes it is called “Big Sandy Lake” to distinguish it from another, smaller lake also called Sandy Lake, about 12 km to to the northwest. 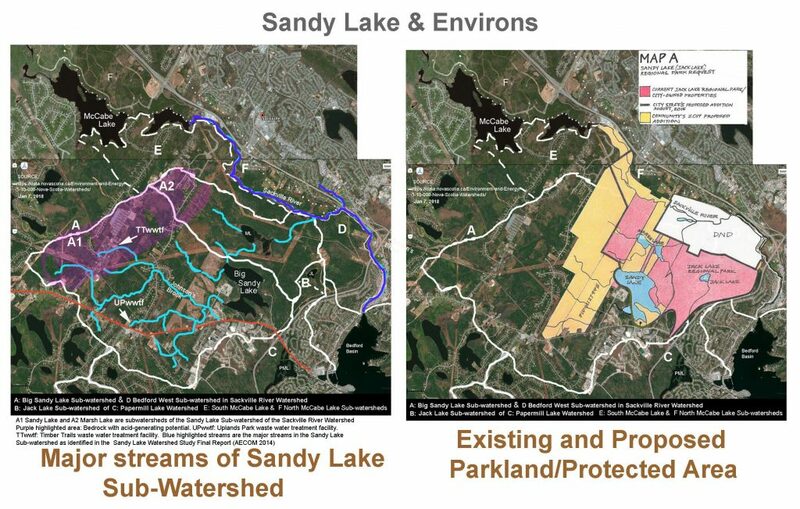 As “Sandy Lake” applies to several more lakes in Nova Scotia and probably to hundreds of lakes in North America, I describe this lake as “Sandy Lake Bedford” or “Sandy Lake (Bedford, Nova Scotia)” when necessary to make it clear which one is being talked about. Otherwise, I refer to it simply as Sandy Lake. 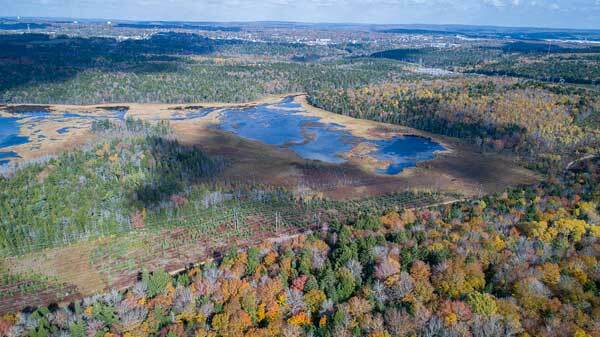 The history of efforts to establish a park in the area of Sandy Lake go back to 1971. 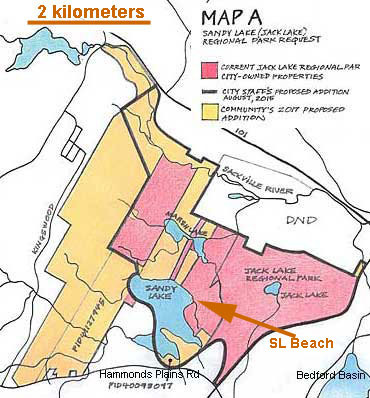 Today, there exists the Jack Lake Regional Park (identified in the 2006 Regional Plan, still to be formally designated*) consisting of approximately 1000 acres (406 hectares) on the eastern side of Sandy Lake, and encompassing the Lions Club Sandy Lake Beach Park, established circa 2000. HRM’s Conceptual Boundaries for the Jack lake Regional Park as identified in 2015* includes the lands inside the black borders in the map at top right; the rose coloured lands are currently owned by HRM. The Sandy Lake Beach Park/Jack Lake Lands currently support diverse recreational activities in all seasons; except forSandy Lake Beach Park, they are mostly informally managed. (3) increase the area of mature and old growth forest habitat and provide a forested wildlife corridor connecting lands of the Chebucto Peninsula with the central and eastern mainland. Please view SLCA/SRA 2017 for more details. Also view Our HRM Alliance. So as not to continually trip over the terminology, I refer to the area as Sandy Lake and Environs (SLE) unless I want to refer to a specific version of the Regional Park or for example only to land currently owned by HRM. I refer to the whole set of observations that I made in 2017 as the “SLE 2017 Observations“. [Big] Sandy Lake is a headwater Lake in the Sackville River system; the Sandy Lake watershed is a sub-watershed and the largest subwatershed of the Sackville River Watershed. About 60% of the watershed is currently undeveloped; fortunately most of the land closest to Sandy Lake in not developed. A large area between Gatehouse Run and the Dairy on the western side of Sandy Lake is zoned “Urban Settlement” but has not been developed. 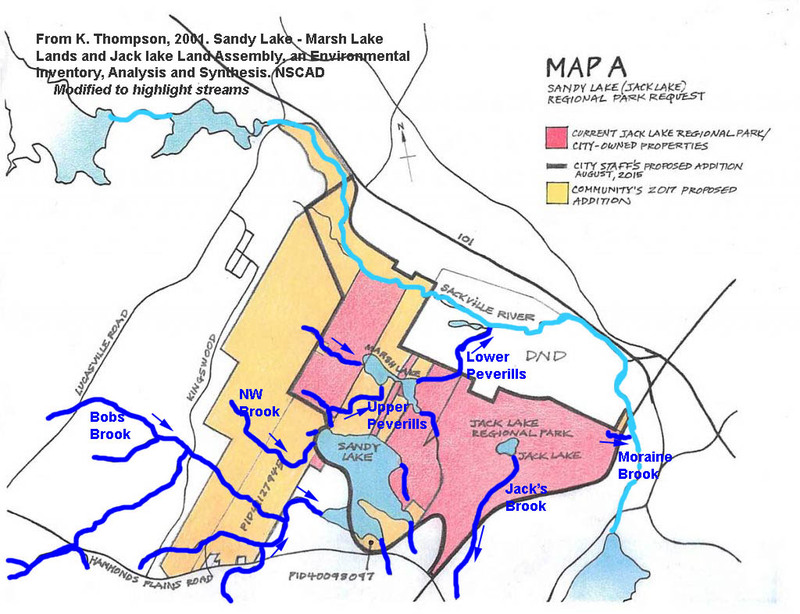 Jack Lake is in a separate watershed (the Jack lake Sub-watershed, a subwatershed of the Papermill Lake Watershed) and drains into Papermill Lake and thence in the Bedford Basin. A small portion of the Jack Lake lands, including Moraine Brook, lies in the Bedford West Sub-watershed of the Sackville River Watershed. 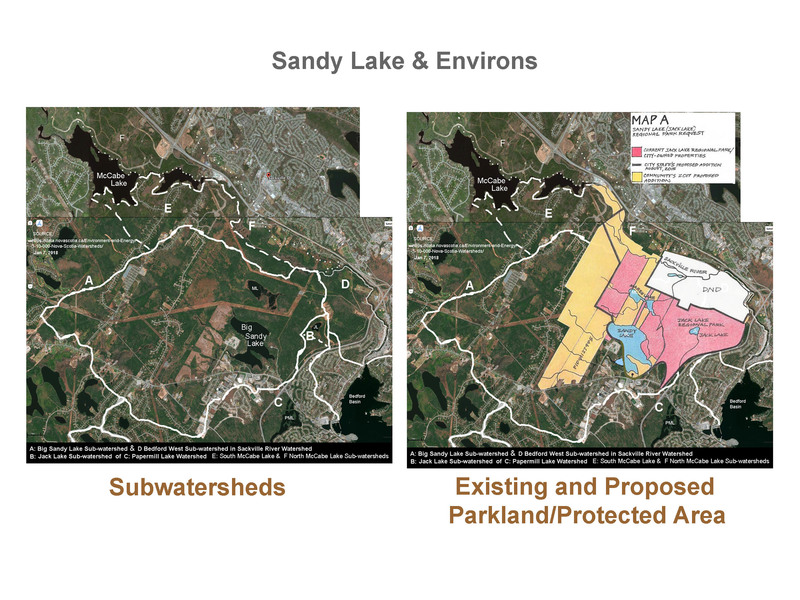 The existing parkland/HRM lands and the proposed Regional Parklands also extend into the South McCabe Lake and North McCabe Lake Subwatersheds – view Existing and proposed parks & protected areas of Sandy Lake & Environs: overlap with 5 subwatersheds. Marsh Lake, downstream from Sandy Lake via Peverill’s Brook; 22 ha; it drains into the Sackville River. 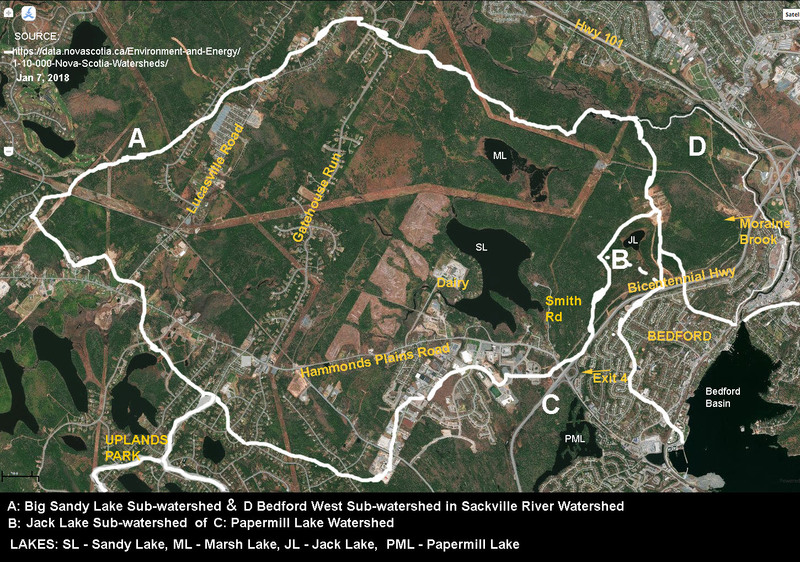 Jack Lake, 2.75 ha, is on a separate watershed; it drains into Papermill Lake (outside of the Sandy Lake Proposed Regional Park) and thence to the Bedford Basin. These occur mostly as small to extensive fringes on the lakes and streams; there are a few bogs in the Jack lake Lands, and a number of treed wetlands (swamps). 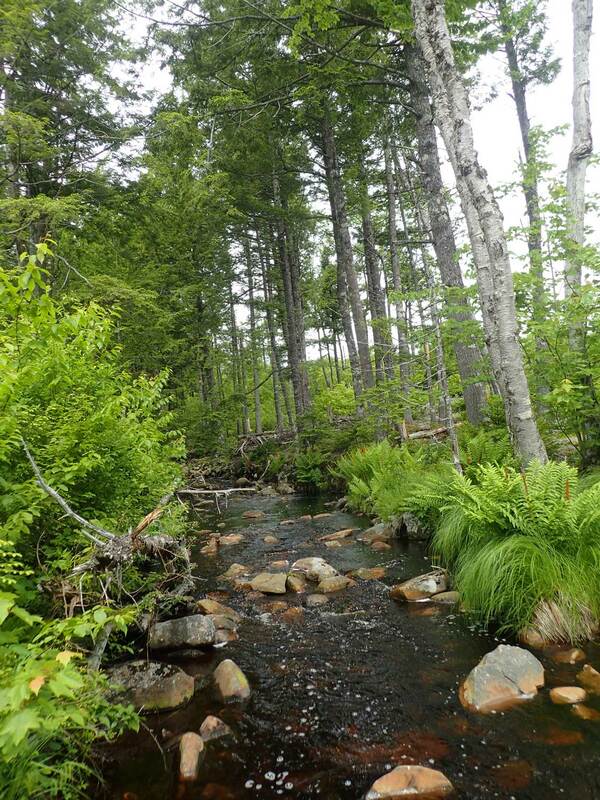 The Sackville Rivers Association utilized Wet Areas Mapping (WAM) data to locate areas of potential wetland development, enhancement, or restoration in Sandy Lake and Environs. Johnson’s or Bob’s Brook. This brook and its tributaries enter Sandy Lake at its southwest corner. This system carries the largest direct input of urban effluents into Sandy Lake, draining developed lands by Hammonds Plains Road, also on Lucasville Road and the Gatehouse Road. Many of the lots are on wells (see Fig 4 in AECOM 2014 report). Acid generating slates occur in the Lucasville Road area (Fig 7 in AECOM, 2014). A large area between Gatehouse Run and Sandy Lake is classified as Small Lot Residential but is not yet developed (see Fig 15 in the AECOM 2014 report). The Uplands Park Wastewater Treatment Facility “discharges approximately 40 m3 of treated effluent per day into a wetland/creek approximately 3.5 km upstream of Sandy Lake…which drains into Sandy Lake” (AECOM, 2014). Northwest Brook (for lack of a name otherwise). This brook enters Sandy Lake at its northwest corner, not far from the outlet. The brook has an approximately 300 m stretch of open water bordered by fen about 600 m upstream from the Sandy Lake. The upper reaches of the brook receive drainage from the Gatehouse Run area and could reach into the acid slate area. Lower down, the brook flows through recently clearcut land and has carried a lot of clearcut debris into the northern end of Sandy Lake apparently expanding the fringing wetlands in that area. Peverill’s Brook, described as Upper Peverill’s Brook where it runs between Sandy Lake and Marsh Lake, and Lower Peverill’s Brook where it runs between Marsh lake and the Sackville River. Both stretches contain salmon spawning habitat. 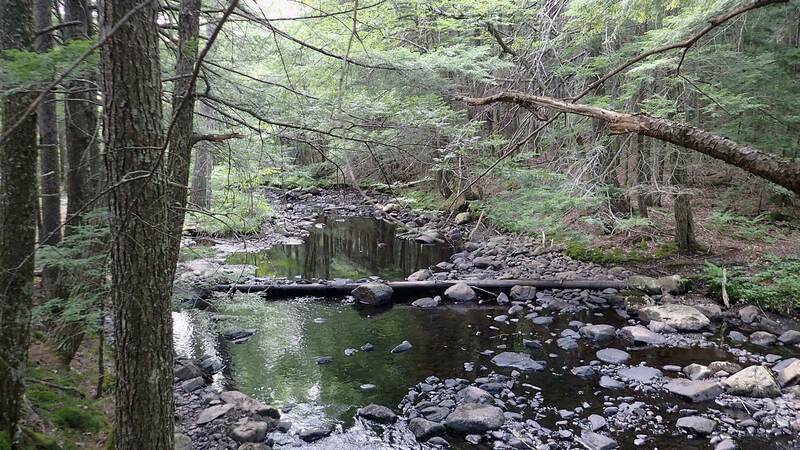 In 2012, the Sackville Rivers Association installed 11 digger logs to improve habitat for salmon (also for gaspereau and sea run speckled trout). Jack’s Brook drains Jack Lake and feeds into Papermill Lake. It is bordered by wetlands. Moraine Brook lies in forest by the sandpits at the eastern extremity of the Jack Lake lands. It drains moraine-like topography supporting hemlock forest, and flows into highway drainage by the Bicentennial and thence into the Sackville River. There are a half dozen other streams flowing into Sandy Lake and Marsh lake as identified on the Thompson 2001 Map above. 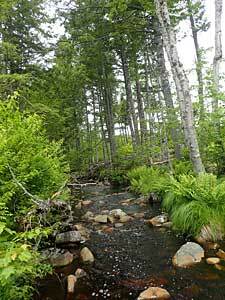 I encountered many seasonal streams on the east side of Sandy Lake, some of them flowing intermittently below ground. 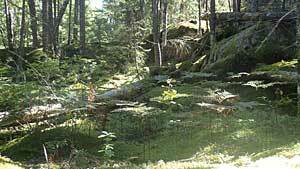 Acadian forest, much of it in a mature to old growth state, covers probably 90% of the landscape. In some areas it is predominately coniferous, in others hardwoods, or mixed (hardwood and softwood). There are lakeside cottages, most of which were “camps” in days gone by, and homes along the western and southwestern privately owned sections of the Sandy Lake frontage, but that lake frontage overall is not densely settled. There is one derelict camp on a small piece of private land on the east side just north of Sandy Lake Beach Park. nature activities such as bird-watching; some wildcrafting (collecting wild plants, mushrooms). There is great potential to increase recreational use of these lands. The Halifax Water Connector road is a natural as an Active Transportation Route – and would require only a few hundred meters to be connected to the Sackville-Bedford Greenway at the point where the Greenway goes under the bridge on Highway 102. (There would have to be protected section for walers on the bridge, or a separate crossing of the river.). The prison yard could serve as a wonderful amphitheatre/space for large public events. View more about the recreational assets. From my perspective there are three major natural assets. Sandy Lake has a pH above 6 and is deep enough (~20 m) to stratify seasonally and maintain a deep layer of oxygenated cold water for cool water salmonids (salmon and speckled trout) though the warm seasons. It supports ocean-going species including gaspereau, salmon and American eel. I observed gaspereau in the shallows on June 21, 2017; others have observed salmon jumping in the lake. Sandy Lake is an important component of the Sackville River Association’s efforts to bring back Atlantic salmon; they have installed digger logs to improve spawning habitat on Peverills Brook which runs between Sandy Lake and Marsh Lake (upper Peverill’s Brook) and thence (Lower Perverill’s Brook) to the Sackville River. (View also Sackville River Watershed Restoration Plan 2015, pages 12-16.) Marsh Lake, a shallow lake, is, apparently, the only recorded location of the fallfish (Semotilus corporalis) in Nova Scotia. The invasive small mouth bass has proliferated in Sandy Lake and makes a predictable catch for sports fishers, while fishing for the bass helps to keep them in check. The wetlands play critical roles in filtering out nutrients, silt and organic debris coming in via streams and as habitat for wildlife. I observed a greater abundance of bullfrogs and green frogs and their tadpoles in the fringing wetlands on Sandy Lake and on the watercourse down to Marsh Lake (likely through to the Sackville River) than I have seen anywhere in Nova Scotia. I was told by a lakeside resident that leopard frogs were much more abundant and bull frogs less abundant in the past. Wood frogs are common in vernal pools in the forests. 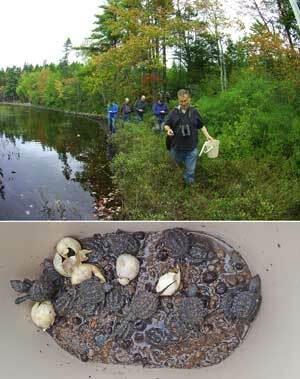 Snapping turtles are found on Sandy Lake, and wood turtles (listed as “threatened” in NS) have also been been reported. According to Clarence Stevens of the local Turtle Watch group (and a well known Halifax area naturalist), snapping turtles were once present in 25 Dartmouth area lakes, today only in three. Snapping turtles were added to our Species-at-risk in 2013, where they are listed as “vulnerable”. 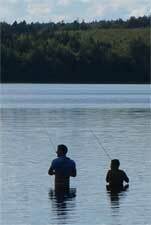 Sandy Lake supports a large population of smallmouth bass; introduced to Nova Scotia in 1942, the fish was reported in Sandy Lake in 2000 and today is commonly caught by sports fishers. They are voracious feeders, thus these fringing wetlands are likely important protective habitat for amphibians and reptiles, as well as systems that produce abundant food for the fish population. Two food items I noted in the fringing wetlands were discarded shells of a freshwater mussel (Pyganodon cataracta), and the exposed, partially eaten roots of Pickerel weed. River otter are seen regularly on Sandy Lake. The otters eat “mostly fish such as minnows, perch and trout, river otters will also eat other aquatic items like clams/mussels and crustaceans, as well as frogs, muskrats, birds (particularly young waterfowl), eggs, insects and even turtles” so evidently are well supported by Sandy Lake. A local resident said he has seen beavers eating the roots of pickerel weed. Halifax is special: the urban core is surrounded not by farms or endless burbs but by forested and coastal landscapes. Even within 30 km of downtown Halifax where approximately three quarters of the population resides, developed areas are interspersed with substantive wild spaces, the major part of it forested. Within that forested landscape, Sandy Lake and Environs plus the mostly forested DND property to the northeast with which it is contiguous, constitute one of the largest single patches of largely undisturbed, mixed Acadian forest with a lot of it in mature to old growth state, and with the full suite of species including those of richer soils such as sugar maple. Trees were harvested from much of the area up to 50-70 or so years ago, but most of it was selective harvesting using horses or tractors and the habitat remains intact or is well on its way to recovering from “highgrading” (taking out all of the larger trees). * An exception is a recent, large clearcut on private land to the west of Sandy Lake but not abutting it directly. A large part of the area clearcut included trees over 100 years of age. 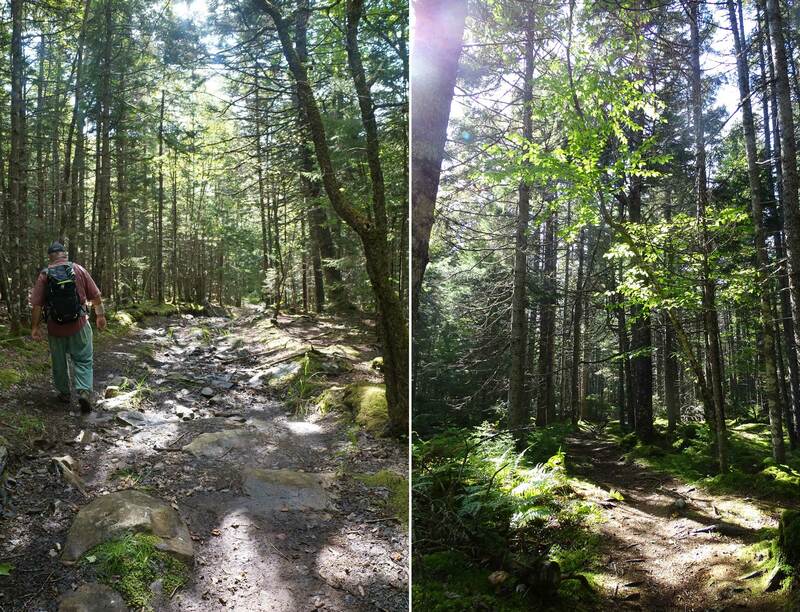 Fortunately, Most of the clearcut is exhibiting vigorous regeneration by a full mix of Acadian forest species. More limited cutting has occurred on some of the recently acquired HRM lands west of Marsh Lake, and there was some clearcutting in the vicinity of the land cleared for the prison on the Jack lake lands, probably in the 1990s. Today there are many trees of different species over 100 years of age, and some hemlock over 200 years of age. These forests have many stories to tell. One of the stories is about wind. The pit and mound topography found throughout much of the forest reveal an ‘old process’ of development towards an old growth state interrupted by wind disturbance, a process that can be seen continuing today in blowdown of big trees initiated by Hurricane Juan. These processes are especially pronounced in this forest close to the windy coast in our windy province. In places, the pit and mound structures occur in a repeated series with the long axes of mounds oriented perpendicular to the direction of wind that blew the trees down; walking across them in the direction of the wind is something akin to swimming or paddling through a set of swells in the ocean. The mounds were formed by blowdowns of very large trees, which I estimate occurred about 150 years ago at many sites. The mounds are preferred ground for establishment of tree seedlings, and most of the big trees we see today are found on top of mounds. The pits often develop as vernal (temporary) pools, providing habitat for amphibians and other organisms requiring water for part of their life cycle. As the trees grow old and mounds erode, the tree roots are exposed creating cavities for wildlife between the roots and the trunk. Trees snap off in a windstorm or just die in place providing “snags” that support another suite of wildlife, and when they fall over, another suite as they gradually return to and enrich the earth. American beech trees which occur both as old dead skeletons (beech wood is very slow to rot) and as some quasi-healthy large trees and as many smaller trees and seedings, tell of another kind of forest disturbance. It was a pest that came to North America via Halifax. 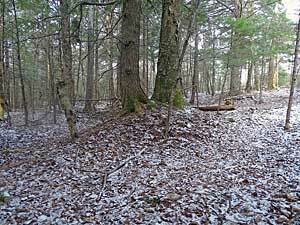 Viewing the beech trees and the pit and mound topography reminds us to think about forest lifespans over longer time intervals than those of our own lives, and that diverse forests in which natural processes are maintained are resilient. Freed from the pressures to clearcut or otherwise improve the forests, we can allow the natural processes to continue. The presence of cyanolichens on the maples tell us this forest is protecting the air by the ground where we walk. The spring wildflowers will tell another story, and birds tell more.And then there are the old forestry roads or routes, and other evidence of forestry in days gone by, and signs of an old farm in the area of the parking lot; and harder to see because they tread more softly on our landscapes, evidence of activities by indigenous peoples. 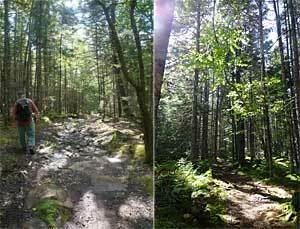 These are fascinating forests that are quite easily accessed with countless trails and spots which allow visitors to bask in the Acadian forest as we might wish it to be over more of Nova Scotia today, but isn’t or is being lost to intensive forestry.View Forests (and subpages) for more. *View Sandy Lake Community Profile (NASCAD doc, 2001) for a description of historical land use. It’s remarkable that Sandy Lake and Environs has remained as intact as it is through years of fairly intensive development nearby. That can be attributed in part to the park component not being well known more broadly within HRM; and to the fact that since the establishment of the dairy plant on 45 acres on the west side of the lake in the 1970s, there has been only minor development closer to the lake.The diary facility had impacts on Sandy Lake when it was constructed but generally today residents in the area see the dairy as a good corporate player. 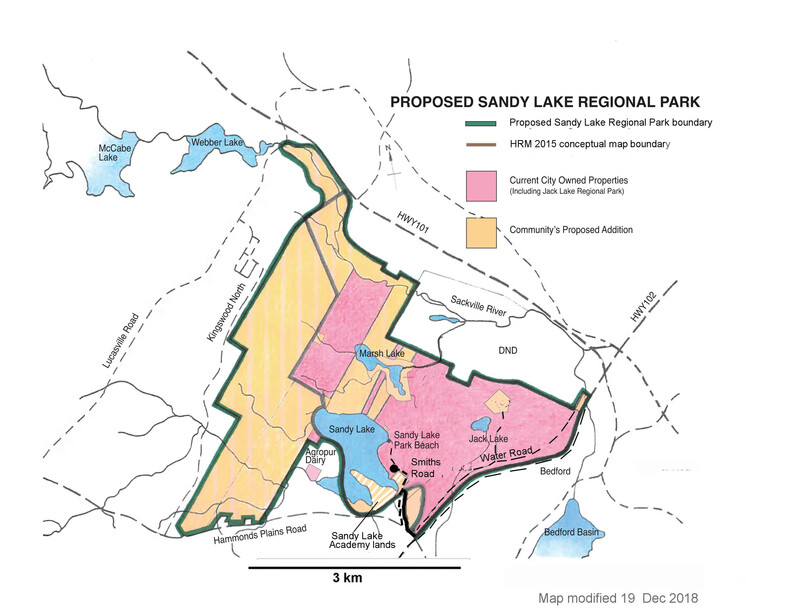 Of concern to the Sandy Lake Conservation Association is the prospect that 892 acres zoned Urban Settlement just west of Sandy Lake could be developed to accommodate 12,000 residents (CBCL, 2009). 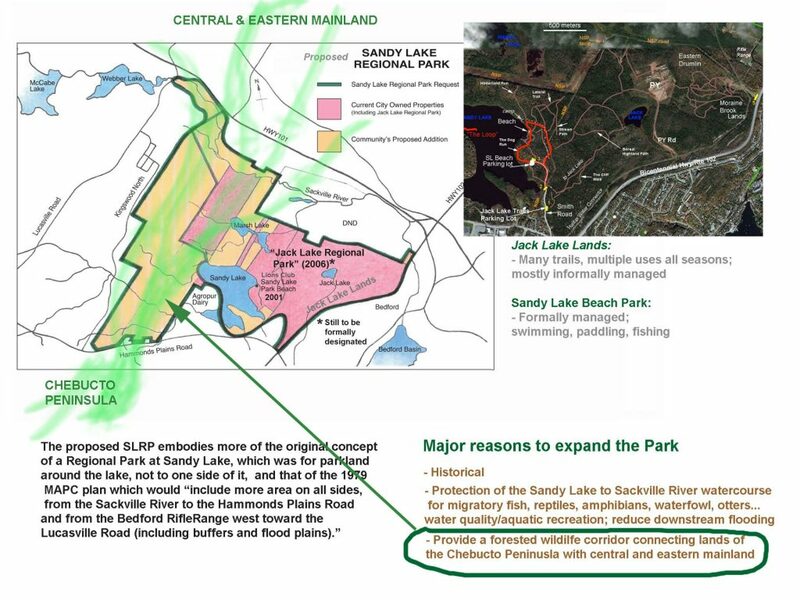 The CBCL document identified the Sandy Lake site as one that could be developed in a cost-effective manner and would provide a positive cash flow to HRM. Decisions about proceeding to a full assessment were delayed until after the Regional Plan + 5 process (implemented June 25, 2014), but in 2013 HRM initiated a Sandy Lake Watershed Study; the consultants (AECOM) submitted a final report in Aug 2014. The primary objective of the AECOM study was to determine carrying capacity of the watershed to meet the water quality objectives. It relied heavily, essentially solely, on a phosphorous loading model to evaluate the impacts of such a development, with and without various mitigative measures. The table below shows the key results. Cumulative impacts of development on phosphorus concentrations are predicted to increase to 16 μg/L for Sandy Lake and 15 μg/L for Marsh Lake when mitigations measures to decrease phosphorus loading are not implemented. These levels are above the early warning values [to meet Mesotrophic state objective those were 15 ug/L for Sandy lake and 13 ug/L for Marsh Lake], but below the water quality objectives. Removing point sources of phosphorus such as the Uplands WWTF and septic systems near Sandy Lake by connecting them to municipal wastewater services decreases the predicted phosphorus concentrations to 15 μg/L and 14 μg/L for Sandy Lake and Marsh Lake respectively. Additional phosphorus mitigation measure using advanced stormwater management that reduces phosphorus runoff by 50% is predicted to further decrease the phosphorus concentration of Sandy Lake to 13 μg/L and of Marsh Lake to 12 μg/L. – why was only the minimum distance of riparian buffers (i.e. 20m) recommended, given the intensity of the proposed development and the rising levels of nutrients and research showing that wider buffers >50 m are required to provide terrestrial habitat services. (iii) it’s clear that the salt is coming from the developed parts of the watershed while those not developed continue to input “clean” (low salt content) water. Visual observations revealed an accumulation of debris from clearcutting at the northwest side of the lake. This contributes to further eutrophication and is evidence of the inadequacy of the 20 m buffer zone.Collectively, these observations underscore SLCA concerns about the AECOM predictions and generally about impacts of significant development close to the lake. 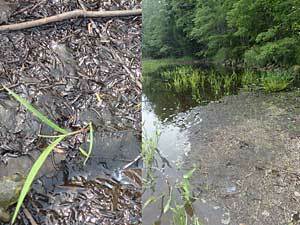 It’s clear that within recent history, Sandy Lake was oligotrophic in nature. So one may wonder why mid-mesotorphic level P values are now considered acceptable for Sandy Lake. With climate warming, there is even more reason to attempt to walk the values back, e.g. by implementing the mitigative measures AECOM cites to existing development, certainly not by hosting more development. Most of the surface waters entering Sandy Lake are on the west side of the lake including the area slated for development. This is a small lake with a narrow fringe of wetlands that are very important for wildlife. Waves from power boats disrupt that system, e.g. by disturbing loon nests, displacing amphibians and fledgling turtles to exposing them to predation by smallmouth bass, and turning over and moving sediments stabilized by aquatic plants. I am told there are three power boats moored on Sandy Lake and the occasional visiting high power boat or a jet ski. More would clearly be highly deleterious. There is no easily accessible public boat launch. – Glossy Buckthorn (Rhamnus frangula) I noted only one plant, also in the vicinity of the parking lot on Smith Road; likewise I suggest monitoring and control (removal) of existing plants. The wooly adelgid is called the “hemlock vampire” for good reason. In 2017 it was found in 5 counties in southwest Nova Scotia. It can take down large hemlocks stands very quickly. 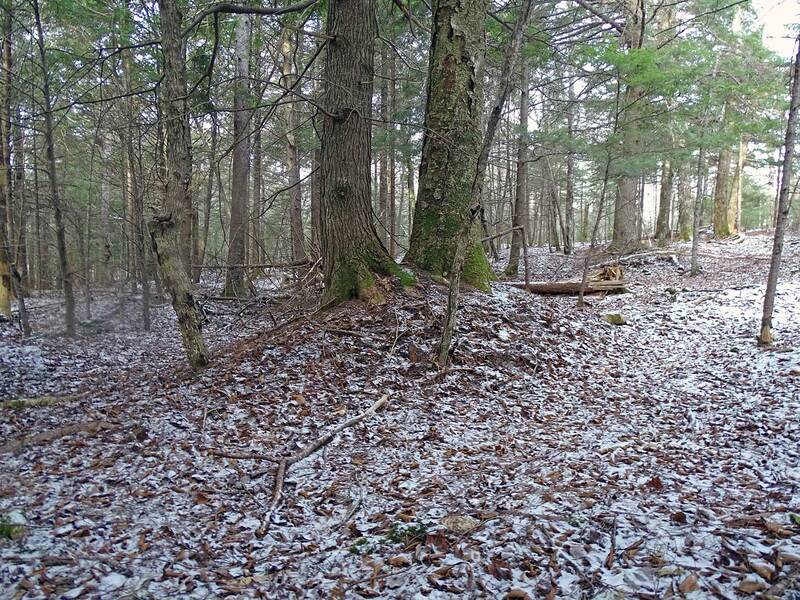 An attack on the “Peninsula Hemlock” stand would probably be the most devastating because except for a few pines, that stand is almost pure hemlock, with trees over 200 years old. Hemlock might fare better in some other areas where there is more mixture with other species, but… ‘Definitely want to keep an eye out for the wooly adelgid. View Hemlock vampires are firmly established in southwest Nova Scotia for a summary of current information about this pest. In the past, Sandy Lake and Environs plus the DNR property has been an important corridor for movement of wildlife between the Chebucto Peninsula (the area below a line drawn between the top of Bedford basin and the top of St. Margaret’s Bay) and the mainland, and that function is recognized in the developing Green Network plan for Halifax. With further development in the area, functionality of the corridor is reduced. In the medium to long term that can affect the ecological integrity of both the area itself and wildlands on the Chebucto Peninusla. Top left: Location of SLE in relation to major protected lands on the Chebucto Peninsula. 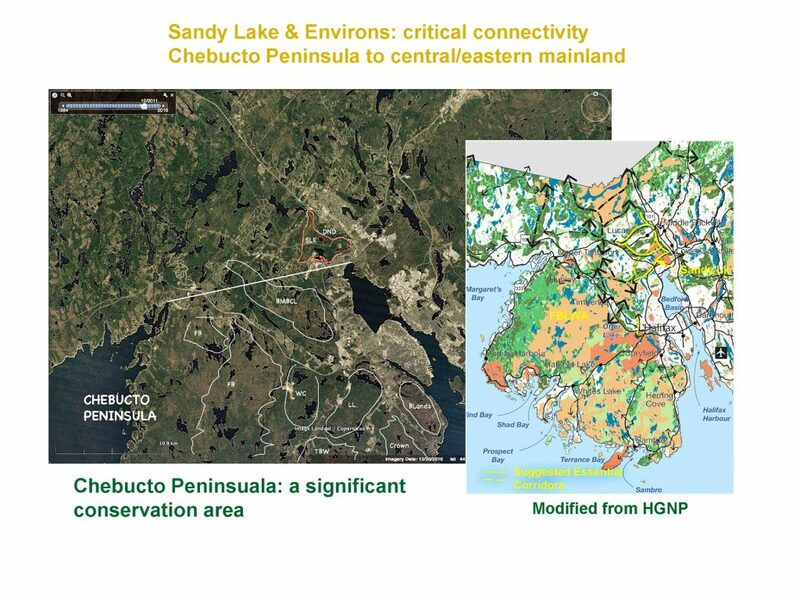 Top right: Corridors identified in the Halifax Green network Plan; the yellow ones are classified as “Important Corridors” the darlk ones as “Essential Corridors”, however the corridors in the area of Sandy Lake are essential for movement between the Chebicto Peninsula and the central and eastern mainland. There are numerous trails and old logging roads in the Jack lake lands/Sandy Lake Lions Park area. There is some ATV & motorized bike (“dirt bikes”) use on those trails but it seems not to be heavy, there is more ATV use on the Power lines, and of ATVs & motorized bikes to the east in forest by the rifle range. The Jack Lake lands are popular for cross country skiing. The lakeshore area is very popular for walking dogs. There is some damage from current levels of use, but I would be more concerned that in future the area could be heavily used and without some coordinated trail management, a lot of damage could occur. I have served on the board and as an active volunteer with The Bluff Trail over the years that use of the trail increased perhaps 10-fold and there was considerable damage (old fire pits, garbage, cutting down of trees for firewood etc) over the first 2-3 years as we attempted to gain control; in the end it required a change from a purely voluntary organization to one in which we have to fundraise to hire a Stewardship Coordinator and 1 or 2 assistants who in turn manage a large number of volunteers. The key is to have direct contact with users and educate them about trail use and the leave-no-trace practices. Appropriate signage is required. With its beautiful forests so close to Halifax, there is tremendous potential for Sandy Lake and Environs as a Regional Park and Wilderness Area. It is large enough to accommodate a wide variety of uses including ATVs and mountain biking, but those need to be targeted and managed. A big plus for Sandy lake and Environs is that there already exist some “corridor trails” in the form of old logging roads and the right of way for power lines and many informal trails; it’s not like they have to be sighted out and constructed, although there is a lot of remedial work to be done, e.g. over wet spots where trails have splintered. Noise is a variable, thus mountain biking, ATV use might be focussed in areas closer to the Bicentennial Highway, and some areas e.g. towards Marsh Lake might be more restricted to allow for quieter, gentler types of activities such as “forest bathing” and bird-watching.The site that was cleared for a prison above Jack Lake could be developed to host a range of outdoor activities and events. So there are both opportunities and challenges to the recreational use of Sandy Lake and Environs. This is a question we need to ask. Halifax is growing rapidly and while it may seem now that we have a surfeit of recreational land, what about in 50 years? It will be very difficult then to reclaim or “re-wild” developed land that in 2018 is still undeveloped. I mentioned above my experience as a volunteer with The Bluff Trail. Use of that trail has skyrocketed to the point that it is a challenge to maintain its ecological integrity. One reason is simply that it has become well known as an established trail offering a wilderness experience. 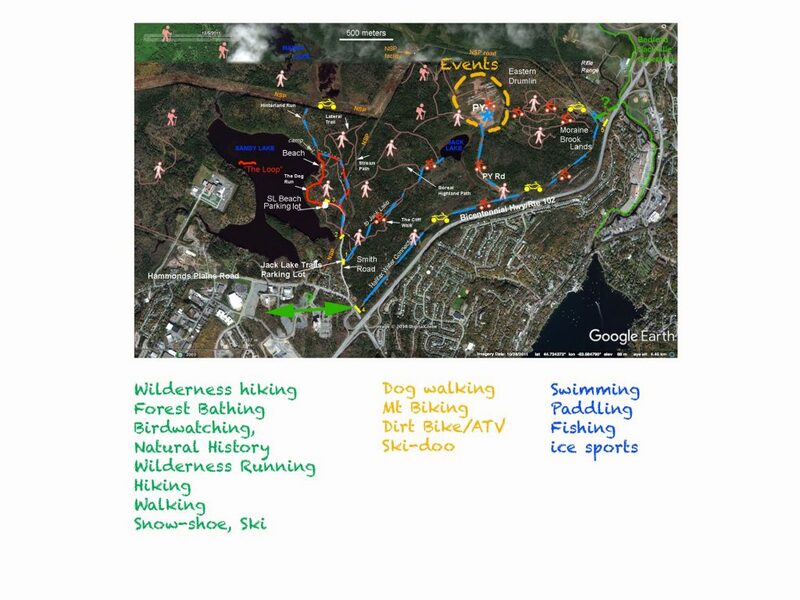 We need more such options as more people, young and old, in HRM take to the outdoors for both exercise and psychological well-being, and are attracted to Halifax because of the outdoor recreational opportunities. I know most of the hiking and multi-use trails in HRM, but I had not known those of Sandy Lake and Environs. 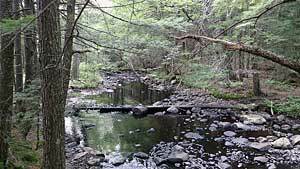 It is an exceptional area, close to core populations areas, offering easy access and access to old forest not readily available elsewhere in HRM and even becoming rare on a provincial scale. It is a safer venue* for walking/hiking than The Bluff Trail, and could accommodate a wider range of recreational activities. *It is not so remote and does not have the precipitous drops found on The Bluff Trail. 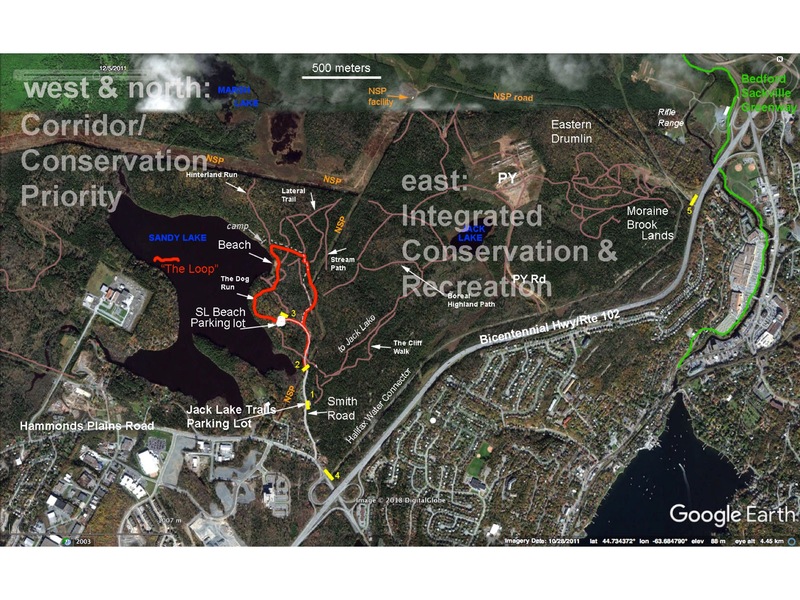 Development of the Urban Reserve land on the west side of Sandy Lake would put immense pressure on Sandy Lake which hosts ocean-going fishes and provides optimal habitat for amphibians and reptiles which are increasingly rare in HRM and globally. It would also put a lot of local pressure on the parkland on the east side of the lake. Much of those Urban Reserve lands have now been clearcut but they are revegetating vigorously with the full range of Acadian forest species. Those lands can return to mixed, multi-aged Acadian forest; to allow them to do so would further protect the Ecological Integrity of Sandy Lake and Environs and even allow the lake to return to an oligotrophic state. Not to do so will likely result in severe degradation of Sandy and Marsh Lake. Surely, our grandchildren’s grandchildren would want us to conserve these priceless lands for wildlife and for all Haligonians to enjoy in perpetuity.